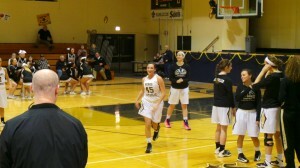 Hayley Kochel and the Lady Raiders did not have much time to celebrate her 1000th career point Wednesday. The Twin Valley girls were back in action Thursday night at Berks Catholic. The Berks Catholic community celebrated senior night and recognized seniors from both the Lady Saints and the visiting Lady Raiders. In total 9 players and managers were honored before the game. However, the celebration would carry over into the game after head coaches Bob Birmingham (Berks Catholic) and Tim Wyatt (Twin Valley) devised a plan. Berks Catholic started seniors Katrina Balatgek, Amanda Fowler, Reba Towles, and Amanda Fellin. Fellin had yet to appear in a game this season after recovering from a serious knee injury. After the Lady Saints controlled the opening tip, Amanda Fellin took the ball down court for an uncontested layup, putting the Saints up 2-0. The Lady Saints then backed off and allowed Twin Valley freshman Kelly Loughery drive the lane to score her first basket of her high school career, tying the game 2-2. After Loughery’s basket, Lady Saints head coach Bob Birmingham called timeout, allowing for the fans of both teams to give a standing and possibly crying ovation for the seniors. The Lady Saints, riding the emotions of Fellin’s bucket, reeled off 17 straight points before Hayley Kochel drilled a three pointer for the Lady Raiders. When the quarter came to a close, the Lady Saints held a 19-5 advantage. Despite it being senior night, Berks Catholic sophomore center Devon Merritt did the majority of the first quarter scoring, as she poured in 7 points during the period. The Lady Saints, led by senior Katrina Balatgek headed into halftime with a 31-12 lead. The second half went very much the same way as the first for both teams, as they began to sub many of their younger players into the game. When the final buzzer sounded, Berks Catholic had earned a 62-25 victory. Leading the way for Berks Catholic was Devon Merritt, who finished with a team-high 15 points. Courtney Wensel added 14 points and 8 rebounds, while Katrina Balatgek contributed 12 points and 5 assists. The Lady Raiders were led by Ms.1000 Hayley Kochel, who finished with 15 of her team’s 25 points. Berks Catholic, who now sits at (15-4, 7-2) will next face Conrad Weiser on Tuesday. Currently, the Lady Saints are tied with Conrad Weiser and Fleetwood for first place in Berks II. The Lady Raiders, who fell to (5-14, 1-8), will travel to Pottsville on Monday.